RunTri: Half Ironman: How Many Athletes Sign up for a Triathlon? Half Ironman: How Many Athletes Sign up for a Triathlon? In the last year, 67,500 triathletes registered to compete in 40 of the world's best half ironman distance events, or about 1700 per race, on average. 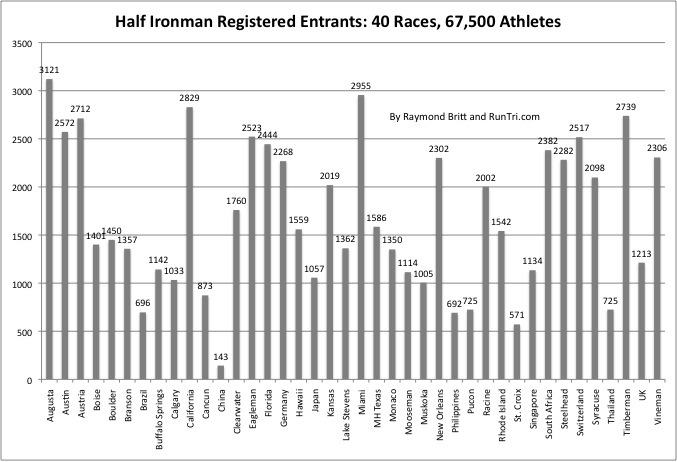 But there are significant differences; 3000+ registered for a half ironman race in Augusta, Georgia; less than 150 signed up for the race in China. The next question: how many actually start and finish a half ironman triathlon? More than 15% for most events. See our analysis here.